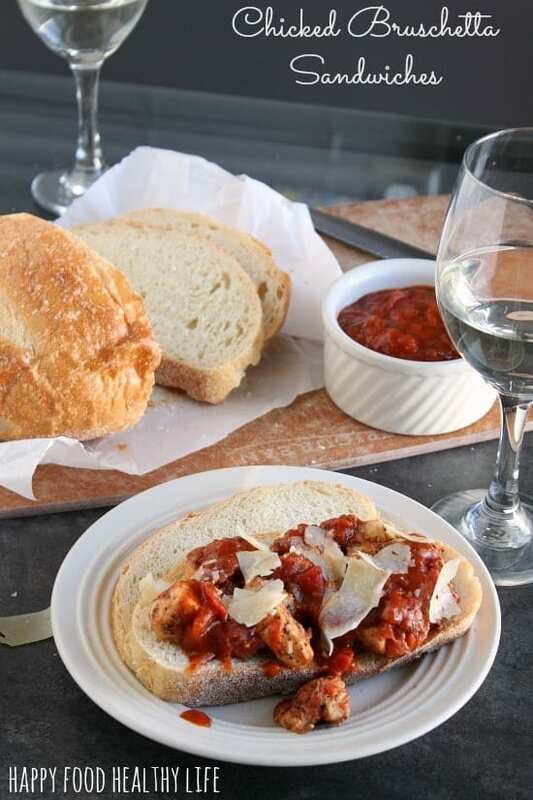 For a Date Night In, as part of a sponsored post for Collective Bias® , I made these easy Open-Faced Chicken Bruschetta Sandwiches using Kraft Recipe Makers to serve to my wife and me while enjoying a glass of white wine. Last weekend, at the last minute, I thought it would be fantastic to surprise my wife with a nice dinner. We were strapped for cash, I didn’t have much time to plan, and I truly didn’t feel like going anywhere. So a “Date Night In” it was! Now the key was to find the best easy meal I could find in as little time possible. 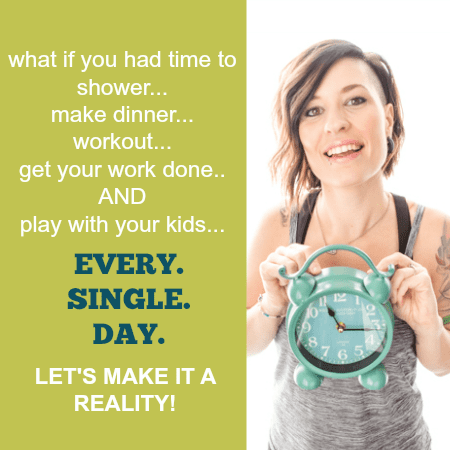 As busy moms trying to juggle full time jobs, a kiddo, a home, and all those other adult responsibilities, date nights are few and far between. Trying to find time for just us is hard to come by, but we know just how important it is for our marriage. Of course, this Date Night In was the perfect opportunity to try out Kraft’s New Recipe Makers. Once I had that down, the only problem I was left with was what flavor to choose! There are a handful of different flavors, and they all sound equally scrumptious. There’s the New England Pot Roast that you can just throw in the slow-cooker for the day. There’s the Three-Cheese Chicken Florentine, that I would probably eat the whole pan of. And then there is the Chicken Bruschetta Pasta that I wanted on a plate in front of me immediately. That was it. I knew I wanted to experience the essence of the bruschetta flavors, but I wanted to be a little more creative and leave out the pasta. The great thing about Kraft Recipe Makers is that they do give you a guideline of what to buy that would go with the sauces included in the box, but you are not necessarily tied down to following those directions to the tee. I wanted to create a meal that I knew my wife and I would enjoy with a nice glass (or 3) of white wine. Pasta can sometimes be heavy. And to be honest, we’re totally into the appetizers-for-dinner situation. So that is what I did. As a vegetarian, I used a soy “chicken-like” product made by Quorn, but of course, there is no problem with you using diced chicken. I am so lucky to have a wife who puts up with all my vegetarian shenanigans and doesn’t even bat an eye when I’ve tossed in that ‘fake meat’ product. I was so thrilled to have Kraft Recipe Makers around to help me create a successful Date Night In. 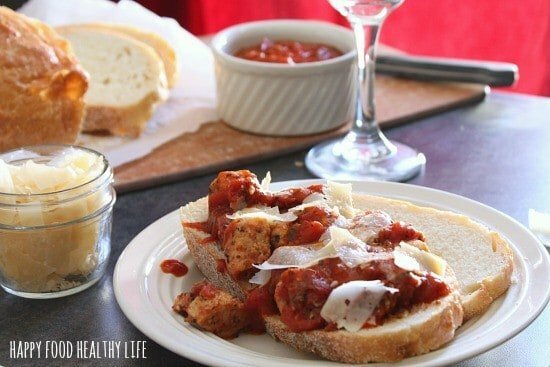 This easy meal took me about 30 minutes to create, we absolutely loved every bite of it, and it helped me to be creative, without having to create a homemade sauce from scratch… although it did taste like it! In a large skillet, cook and stir diced chicken in half the Simmering Sauce included in the box. Cook until completely browned. Add drained tomatoes and the remaining Simmering Sauce and cook on high until liquid has cooked out. Mix in about half of the finishing sauce. 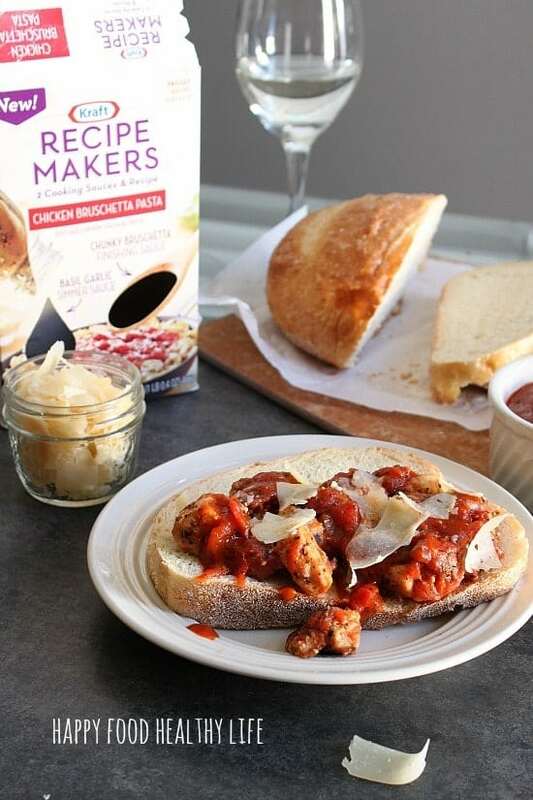 Spoon chicken mixture on top of the sliced sourdough or Italian bread, top with additional finishing sauce and shaved Parmesan cheese. Check out more ways to create the best easy meals. Thanks Heather! It was fun to think outside the box a bit! Holly that looks delicious. 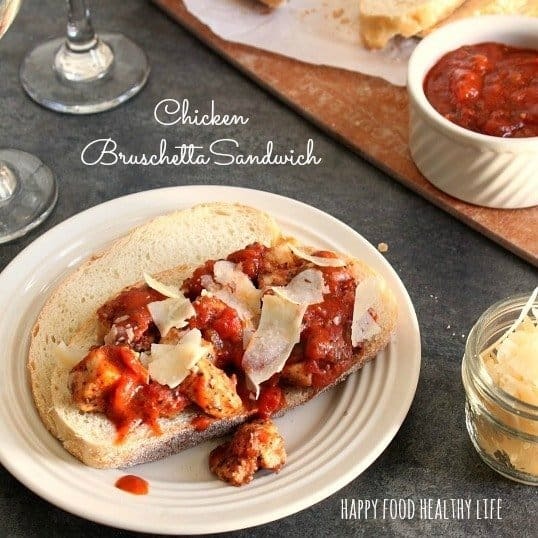 I have been meaning to try those Kraft Recipe Makers and this bruschetta one looks awesome! Especially with a glass of wine, the perfect date night in date! 🙂 Great idea, I bet your wife loved it! I hope you do try it out! You won’t be sorry! Thank you Tonia! I’m kinda craving it at the moment to be honest! What a great idea…this looks so delicious! Thanks for sharing! You are so very welcome! Nothing like comforting food for a date night in!